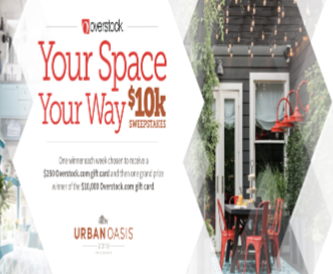 Overstock Your Space Your Way 10K Sweepstakes – Win $10,000! ENTER SWEEPSTAKES HERE – Overstock Sweepstakes page. SWEEPSTAKES ENTRY PERIOD – Beginning at 9:00 a.m. Eastern Time (“ET”) on October 1, 2018 until 5:00 p.m. ET on November 21, 2018. PRIZES – Grand Prize: The Grand Prize Winner will win the following (the “Grand Prize”): $10,000 Overstock.com gift card. Approximate retail value (“ARV”) of the Grand Prize: $10,000. Weekly Prizes: Each Weekly Prize Winner will win the following (the “Weekly Prize”): $250 Overstock.com gift card. ARV of the Weekly Prizes: $2,000. ARV of all prizes: $12,000. WINNER’S LIST – Beginning on or about December 10, 2018, you may obtain the names of the winners by going to the Website.